dayspamagazine.com | AUGUST 2014 109 tailored to licensed professionals in four typical career paths—independent contractors, employed estheticians, spa owners and esthetic instructors—and offers targeted training and resources to help professionals improve upon technical and business skills. Eufora YOU School Academy, Vista, CA (800.638.3672, eufora.net) • Salon Coordinator Program teaching professionals how to transform front desk staff from receptionists to business managers InSPAration Management, Daytona Beach, FL (386.226.2550, insparationmanagement.com) • Freedom Learning, a web-based advanced education program International SPA Association, Lexington, KY (888.651.4772, experienceispa.com) • Certifi ed Spa Supervisor and Retail Management courses, and Risk Management for Spa e-Learning course Milady Cengage Learning, Clifton Park, NY (800.998.7498, milady.cengage.com) • MiladyPro—Online continuing education for professionals NW Aestheticians Guild, Seattle (206.386.6000, nwaestheticiansguild.com) • Guild-sponsored continuing education Professional Beauty Association Center for Business Education, Scottsdale, AZ (800.468.2274, probeauty.org/cbe) • Classes and web workshops, including Increasing Productivity, Best Practice Club and Building Your Business: Culture and Leadership Spa College, online portal (415.515.9262, spa-college.com) • Training includes Spa Manager Certifi cation Intensive, Advanced Bodywork and Massage Certifi cation UC Irvine Extension, Irvine, CA • Certifi cate program in spa and hospitality management that offers online and on- campus classes, and provides credit toward the online Master of Wellness program hosted by the Royal Melbourne Institute of Technology (RMIT University) in Australia (949.824.2033, unex.uci.edu/spa) • Free online Spa & Hospitality Course (949.824.5414, ocw.uci.edu/courses) Universal Companies Advance with Education, Abingdon, VA (800.558.5571, universalcompanies.com/learnandgrow) • Continually expanding library of spa industry videos, classes and on-demand webinars University of Spa & Cosmetology Arts/Massage Therapy, Springfi eld, IL (217.753.8990, uscart.com) • Business and certifi cation programs Spas2B Online Spa Management Certifi cate Courses, Waterloo, ON (519.585.0628, spas2b.com) • Online business and certifi cation programs that cater to both new and existing business owners, and allow professionals to achieve their certifi cates in spa management in 30 or fewer days. 2014 ISPA Conference & Expo PREVIEW The theme for the upcoming 2014 International SPA Association (ISPA) Conference & Expo is "Create", and the highly anticipated event promises to hold true to the moniker, creating for its attendees an unforgettable and inspiring experience—and encouraging them to pass along the favor. Scheduled to take place on October 13-15 at the Mandalay Bay Convention Center in Las Vegas, the conference and expo will commence each day with one of its popular General Sessions and, as usual, will present an eclectic series of accomplished speakers. Erik Wahl, former corporate executive turned internationally recognized graffi ti artist, author and speaker, will kick off the event with an on-stage painting presentation to inform and challenge the audience. Day two will feature Mike Walsh, CEO of consumer innovation research lab Tomorrow and considered authority on 21st-century business. And winding up the series on the last day will be famed singer/songwriter Jewel, whose passion for the arts ultimately led her to become involved in numerous philanthropic efforts. A highlight of the three-day event will be the presentation of the Visionary Award to beauty industry leader and innovator Jane Iredale, founder, president and CEO of Iredale Mineral Cosmetics. "The opportunity to personally call Jane to tell her she was this year's recipient was such a special moment," noted ISPA chairman Michael Tompkins. "She is beyond deserving of this honor." ISPA-goers will also have the opportunity to: browse the showroom fl oor and become familiar with the latest wares from top spa product manufacturers around the globe; expand their knowledge and skill sets with a wide selection of enlightening classes and demonstrations; network with colleagues at numerous social events; and even participate in some good-humored bidding wars at the ISPA Foundation Auction. To fi nd out more about the ISPA organization and the upcoming conference, visit experienceispa.com. ISPA Conference speakers dazzle and inspire. 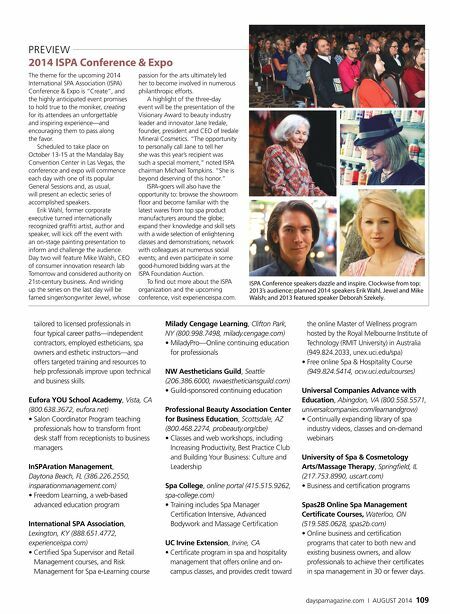 Clockwise from top: 2013's audience; planned 2014 speakers Erik Wahl, Jewel and Mike Walsh; and 2013 featured speaker Deborah Szekely.